The sheer scale of space is overwhelming. Oh, sure, we have words to make it more palatable, like “light-years”—as if a distance of 10 trillion kilometers is graspable by our puny simian brains. And when I think about our galaxy, the Milky Way, I know that it’s 100,000 light-years across, but that’s just a number, the reality too huge to truly hold in my mind. And I look at that, and my brain parses it, dissects it, counts the zeroes, makes analogies, uses scientific notation … all in an attempt to grasp the ungraspable. So how many stars is that, really? Here, this might help. Or it might crush your brain further. That is a mosaic of 50 separate images of the galactic center taken by astrophotographer Robert Gendler. It’s a stunning 60 hour total exposure using a small but extremely high-quality telescope, and it shows a stunning number of stars and other objects. As I perused it I saw a lot of familiar sights, including the pink glows of the Lagoon and Trifid Nebulae on the right, and the Cats Paw Nebula to the left of NGC 6357, both in the lower left. Holy stelliferous nights! Now you’re starting to get a glimpse of what I mean. You can see tens of thousands of individual stars, perhaps more. And even that is nothing. When you look at the whole photo, all of the yellowish glow, all of it, is actually coming from stars. That’s not gas, or dust; it’s the combined light coming from billions of stars, all too far away to resolve as individuals. In fact, the dark areas aren’t where there are no stars, they’re where dust clouds block our view of even more stars behind them! 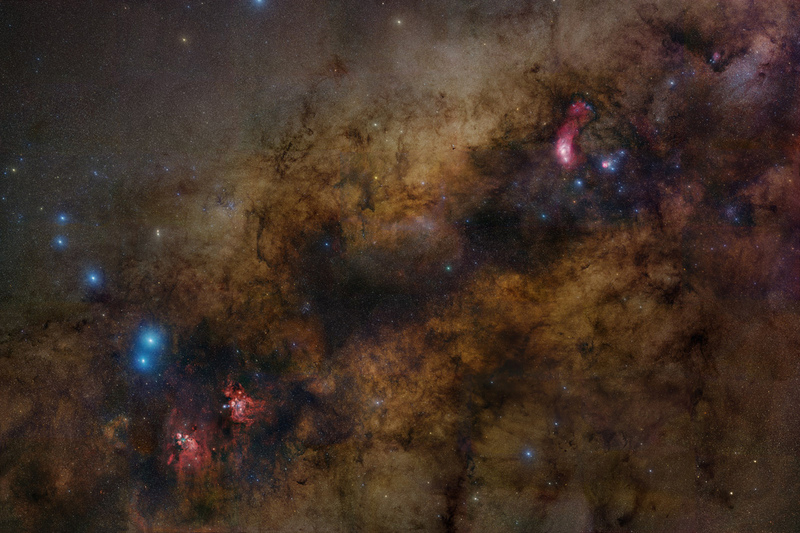 And this is still just a small section of our galaxy. While the image shows a big chunk of sky, roughly 30° across, the Milky Way is still far, far larger. And that’s when I can’t do it any more. The numbers I understand, but the realityof them is too huge. When I was a kid—this is true—I used to look up at the sky and fear that some day we’d explore everything and run out of things to discover. I was completely wrong. We’ll never run out of sky. Just look at it. And while it may make some people feel small and insignificant, I get exactly the opposite feeling: that we can even attempt to understand all this—and that, in so many ways, we actually do—makes us big indeed. *Correction, Oct. 12, 2014: When I first drafted this article, I used 100 billion for the number of stars in the galaxy, trying to keep it general. But the actual estimate is 200 billion to 400 billion, and I didn’t want to be off by that much, so I made the number more specific. However, I initially forgot to update the title, which still said 100 billion when I first posted the article. My apologies for any confusion.